To compare the muscle pathology findings among subgroups of idiopathic inflammatory myopathies (IIM) patients, and to determine the correlations of muscle biopsy scores with muscle power and creatine kinase (CK). The medical records of IIM patients consisting of the demographic data, clinical parameters and laboratory conducted were retrospectively reviewed. Their initial muscle biopsies were reviewed, and four domains were scored: inflammation, vascular, muscle, and connective tissue. Ninety-five IIM patients (28 patients with idiopathic polymyositis (PM) 9 idiopathic dermatomyositis (DM), 5 DM associated with malignancy, and 53 PM/DM associated with connective tissue disease) with median (IQR: Q1, Q3) disease duration of 1.2 (0.5, 3.1) months were included. No significant differences in initial muscle pathology findings and muscle pathology score among the subgroups were found. Muscle degeneration and endomysial fibrosis scores were negatively correlated with muscle power (r=-0.23 and-0.24, respectively, p<0.05) and positively correlated with CK (r=0.27 and 0.39, respectively, p<0.01). No significant correlation was detected either inflammation or vasculitis scores with muscle power and CK levels. In this study, muscle biopsy cannot be used to differentiate among subgroups of IIM patients. In addition, we found only modest correlation of muscle biopsy scores with muscle power and CK. Further study is necessary to confirm our findings. Keywords: Idiopathic inflammatory myopathies, IIM, Polymyositis, Dermatomyositis, Muscle biopsy, Biopsy score. Idiopathic inflammatory myopathies (IIM) are a heterogeneous group of diseases characterized by chronic inflammation of muscle fibers and which result in skeletal muscle weakness. The Bohan and Peter criteria [1, 2] are the most commonly used classification criteria for IIM diagnosis worldwide because they are simple and easy to use for general physicians and in general hospitals. The method has been criticized, however, for overdiagnosis of polymyositis (PM) [3, 4]. The classification criteria are essential for the diagnosis of IIM [1, 2, 5-7], in which muscle pathology is a component used in conjunction with other clinical and laboratory variables. To date, several muscle pathology scoring systems have been investigated for correlations with muscle weakness and serum muscle enzymes; however, those scoring systems have not yet been fully validated [8-10]. In addition, data regarding the differences in the muscle pathology findings between subgroups of IIM have been limited. Furthermore, discrepancies of data regarding the correlation of histo-morphological muscle alterations with clinical and laboratory parameters in IIM among the different studies have been reported [8, 9, 11, 12]. This study was conducted to compare muscle biopsy findings and muscle biopsy scores among subgroups of Thai patients with IIM and to examine correlations between muscle biopsy scores and clinical variables. A retrospective study was conducted on adult IIM patients (age 18 years or older at diagnosis) who had undergone open muscle biopsy and who had been followed up at the Rheumatology Clinic, Maharaj Nakorn Chiang Mai Hospital, Chiang Mai University, Thailand, from January 2003 to December 2011. The rheumatologists in charge of inflammatory myopathies patients in the rheumatology clinic selected the sites for muscle biopsy for diagnosis confirmation and distinguishing from other myopathies such as inclusion body myositis or necrotizing autoimmune myositis. Selected sites were primarily on muscles which having muscle power grade 2-4. All patients fulfilled the 1975 IIM classification criteria [1, 2]. Using those criteria, the patients were divided into four subgroups: group 1 – patients with idiopathic polymyositis (PM); group 2 – patients with idiopathic dermatomyositis (DM); group 3 – cases of IIM associated with malignancy; and group 4 – cases of IIM associated with connective tissue diseases (CTD). The diagnosis of rheumatoid arthritis (RA), systemic lupus erythematosus, and systemic sclerosis (SSc) was based on the American College of Rheumatology (ACR) revised criteria for classification of RA , SLE  and SSc , respectively. Patients whose muscle pathology slides were not available for review were excluded from the study. For patients who had multiple muscle biopsies, the initial biopsy was used for analysis. This study was approved by the Research Ethics Committee, Faculty of Medicine, Chiang Mai University. The onset of IIM in this study was defined as the time of the first report of muscle weakness or DM rash as recorded by the physician. Disease duration was defined as the interval between disease onset and the time of the initial muscle biopsy. The following data was recorded as of the date of the initial muscle biopsy: demographic data, diagnostic criteria, clinical manifestations, muscle pathology findings, laboratory tests conducted, current dose of corticosteroid (CS) and kind of immunosuppressive drug currently used. We defined pulmonary artery hypertension (PAH) as an estimated systolic pulmonary artery pressure (SPAP) > 50 mmHg at rest, with normal left ventricular ejection fraction on Doppler echocardiography (Echo) . Myocarditis was defined as cardiac global hypokinesia determined by Echo and elevated cardiac enzyme (creatine kinase MB isoenzyme) that was not explained by other causes. Interstitial lung disease (ILD) was determined by presence of pulmonary fibrosis on plain chest X-ray or high-resolution computed tomography (HRCT.) Muscle power was graded on the 6 point Medical Research Council Scale  which ranges from 0 (muscle weakness with no visible muscle contraction) up to 5 (normal muscle strength). Recorded muscle power was calculated as summation of proximal muscle power of both upper and lower extremities and then divided by four. Muscle specimens were submerged for 10 seconds in isopentane (2-methyl butane) cooled by liquid nitrogen, then serial 5 μ-thick sections were prepared using Hematoxylin and Eosin (H.&E.) stain. All muscle biopsies were interpreted by an experienced muscle pathologist (S.S.). For each muscle biopsy, information of four domains including inflammation, vascular, muscle, and connective tissue based on the 2007 international consensus proposed-score system for muscle biopsy  was recorded. A Likert scale was then created to grade the degree of pathological involvement in each domain as shown in Table 1. Data were expressed as percentage, mean (SD), or median (interquartile range: [IQR: Q1, Q3]), where appropriate. 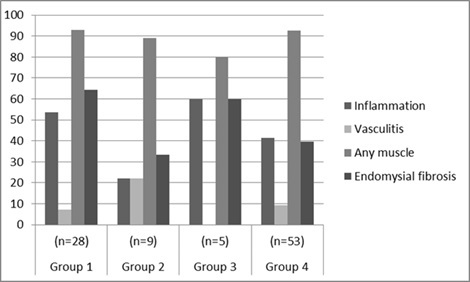 Categorical variables, parametric continuous variables and non-parametric continuous variables in the four groups of patients were compared using the Fisher’s exact test, one-way analysis of variance, and Kruskal-Wallis test, respectively. The multivariable linear regression analysis was used to evaluate the association between age, gender, disease duration, current dose of CS and immunosuppressive drug use and each muscle biopsy scores. Correlation between muscle pathology scores and clinical variables was determined using the Spearman’s rank correlation coefficient. Statistical analyses were performed using the Statistical Package for Social Sciences software version 17.0 (SPSS, Chicago, IL, USA). For all statistical analyses, p-values <0.05 were considered statistically significant. Table 1. Muscle biopsy scores. The 95 IIM patients (74 females and 21 males) had a mean age ±SD of 47.4±12.8 years and median (IQR: Q1, Q3) disease duration of 1.2 (0.5, 3.1) months. On the day of the biopsy, proximal muscle weakness was presented in all the cases. Muscle biopsy was performed on the bicep muscle in 87 patients (91.6%) and on the quadriceps muscle in 8 (8.4%). Elevated serum creatine kinase (CK), aspartate aminotransferase (AST), and alanine transaminase (ALT) were observed in 87 of 95 patients (91.6%), 86 of 91 patients (94.5%), and 71 of 91 patients (78.0%), respectively. Elevated serum erythrocyte sedimentation rate (ESR>20 mm/hr) was observed in 53 of 64 patients (82.8%). Based on Bohan and Peter’s classification criteria, the study population was divided into four subgroups consisting of 28 cases (29.5%) with idiopathic PM (group 1), 9 cases (9.5%) with idiopathic DM (group 2), 5 cases (5.3%) associated with malignancy (group 3), and 53 cases (55.7%) associated with CTD (group 4). In group 3, all the five cases had DM associated with malignancies (one case each of basal cell carcinoma, adenocarcinoma of the stomach, ovarian cancer, papillary carcinoma of thyroid, and gastrointestinal stromal tumor). In group 4, PM was associated with CTD in 51 cases (SSc in 23 cases, SLE in 15 cases, mixed connective tissue disease in 8 cases, RA in 3 cases, and unclassified CTD in 2 cases) and DM associated with CTD in 2 cases (one each of SSc and SLE). Table 2. Clinical characteristics of patients with IIM. Group 1 = idiopathic PM, group 2 = idiopathic DM, group 3 = PM/DM associated with malignancy, and group 4 = PM/DM associated with CTD. Categorical variables, parametric continuous variables and non-parametric continuous variables in the four groups of patients were compared using the Fisher’s exact test, one-way analysis of variance, and Kruskal-Wallis test, respectively. Immunosuppressive treatment: a = methotrexate; b = azathioprine; c = methotrexate (n=5), cyclophosphamide (n=1), d-penicillamine (n=1), leflunomide (n=1), and mycophenolate mofetil (n=1). Pulmonary involvement: f=5 ILD and 1respiratory muscle weakness; g= 13 ILD, 1 pleural effusion and 1 respiratory muscle weakness. Details of the demographics, pathologic classification, current dose of CS and kind of immunosuppressants used, clinical characteristics, and laboratory test results of the study population by subgroup are provided in Table 2. Upon comparing the initial muscle biopsy among the subgroups, we found that the group 4 patients had the shortest disease duration. No significant differences in the proportion of patients receiving corticosteroid or immunosuppressive treatment before muscle biopsy were found. Group 4 patients had more cardiac complications (myocarditis in 4 cases, mild to moderate pericardial effusion in 8 cases, and pulmonary artery hypertension in 6 cases) than patients in the other subgroups. There were no significant differences in myalgia, arthritis, dysphagia or pulmonary involvement among the subgroups. Seventy patients had undergone biopsy prior using corticosteroids (prior CS) and 25 patients had undergone biopsy after using corticosteroids (after CS). Of the prior CS patients, patients in group 4 had the highest muscle power and ESR, but the lowest CK levels. Additionally, CK levels were highest in the group 1 patients. Among the after CS patients, no significant differences in muscle power and CK levels among the four subgroups were observed. However, the highest ESR in group 4 was still persisted. Fig. (1) shows the frequency of the four domains of muscle pathology findings of the different subgroups. No significant differences among groups were identified. A similar comparison, excluding 25 patients who had undergone biopsy after using corticosteroids, likewise detected no significant differences in muscle pathology findings among the four subgroups (data not shown). A comparison of study population muscle biopsy scores by subgroup are provided in Table 3. Among the prior CS, the patients in group 1 had significantly higher degeneration scores and endomysial fibrosis scores than the other subgroups, while no significant differences among the subgroups with respect to the remaining two domains (inflammation and vasculitis) were detected. Similarly, there were no significant differences among the groups with respect to the four domain scores in patients who had undergone biopsy after using corticosteroids. Additionally, in the total group, the results of the multivariable linear regression analysis after adjusted for age, gender, current dose of CS and immunosuppressive drug use and each muscle biopsy scores showed that only disease duration modest correlated with vasculitis score (R2=0.34, ß =0.18, p=<0.01), atrophy score (R2=0.04, ß =0.06, p=0.047) and total muscle biopsy score (R2=0.07, ß =0.28, p=0.01). No significant association was observed between the age, gender, CS use and immunosuppressive drug use and the remaining muscle biopsy scores (data not shown). Table 3. Muscle biopsy scores of patients with IIM. p-value is from the Kruskal–Wallis test. Prior CS=underwent biopsy prior using corticosteroid; After CS= underwent biopsy after using corticosteroid. Correlation coefficients of muscle pathology scores with the clinical variables are shown in Table 4. For the total group of patients in the study, muscle domain scores (degeneration and invasion of non-necrotic fiber), connective tissue domain scores (endomysial fibrosis), and total biopsy scores showed only a weak positive correlation with serum CK levels (r=0.24 -0.39, p<0.05). The degenerative scores and the endomysial fibrosis scores showed a weak negative correlation with muscle power (r=-0.23 and -0.24, respectively, p<0.05). In the prior CS group, the magnitude of the correlation of degenerative scores, invasion of non-necrotic fiber, endomysial fibrosis scores and total biopsy scores with serum CK levels was higher (r=0.32 -0.51, p<0.01). However, there was no significant correlation between muscle biopsy scores and ESR. Fig. (1). The frequency of muscle biopsy domain findings of patients with IIM. The clinical findings, laboratory results and pathology findings of the 95 Thai patients with IIM were analyzed retrospectively. Similar to other studies [8, 9, 18-24], our IIM patients were predominantly female with a mean age of 40-50 years. The majority (55.7%) of our IIM patients were in group 4, higher than the 14.0% to 44.1% reported by other studies [8, 9, 18, 19, 21, 23, 24]. As expected, group 4 patients had a higher prevalence of arthritis and cardiopulmonary involvement than did patients in the other subgroups. We found that SSc was the most common CTD in group 4, a finding that differs from other studies which have reported that SLE was the most prevalent CTD associated with IIM [18, 24]. The variations in the findings of the different studies could be due to the diversity in the different study populations. Interestingly, the malignancies associated with IIM in our study population consisted of basal cell carcinoma, adenocarcinoma of stomach, ovarian cancer, papillary carcinoma of thyroid, and gastrointestinal stromal tumor, a finding which differs from reports from other Asian countries - Taiwan  and Singapore - which report nasopharyngeal cancer as being the most common associated malignancy. Again, the diversity of the study populations with their different genetic makeup and environmental backgrounds may be an explanation for these differences. Table 4. Spearman’s rank correlation coefficient of muscle biopsy score with clinical and laboratory variables. Prior CS=underwent biopsy prior using corticosteroid; After CS=underwent biopsy after using corticosteroid. In this study, we developed a new Likert muscle biopsy scoring system based on the four domains of the 2007 international consensus proposed-score system for muscle biopsy . We found that endomysial fibrosis scores were lowest among the group 4 patients, the group which had the shortest period between weakness and biopsy, reflecting an early stage of myopathy. Patients belonging to group 1 had the highest degeneration scores and endomysial fibrosis scores; they also had longer average disease duration than group 4 patients, a reflection of connective tissue increases during the chronic stage . There was a significant difference in muscle biopsy scores between patients who had undergone biopsy before using corticosteroids and those who had undergone biopsy after using corticosteroids. The timing of the use of corticosteroid, either before or after biopsy may influence pathology scores. We found no significant differences in frequency among the four pathological subgroup domains, an indication that muscle biopsy is not an effective means of differentiating between the various subgroups of IIM patients. This finding is concordant with the report of Schwarz et al. , although a different scoring system was used in that study. In contrast to our findings, Prasad et al. reported that patients who had myositis associated with CTD had significantly more vasculitis than either idiopathic PM patients or idiopathic DM patients. Ringel et al. reported that inflammatory myopathy associated with CTD was most similar to idiopathic DM, with patients having more perivascular inflammation than idiopathic PM patients, which is different from our findings. The differences in findings among the various studies may have stemmed from differences in the study populations. The degenerative and endomysial fibrosis scores of all the patients in this study combined showed a weak positive correlation with the CK levels (r=0.27 and 0.39, respectively, p<0.001), while those scores showed a weak negative correlation with muscle power (r=-0.23 and -0.24, respectively, p<0.05). The total biopsy scores showed only a weak correlation with CK levels (r=0.24, p<0.05). Interestingly, no significant correlation was detected either inflammation or vasculitis scores and muscle power, CK, or ESR. Therefore, damaged muscle fiber rather than active inflammation contribute to high CK levels and impaired muscle power. The influence of the use of corticosteroids or other immunosuppressants before a biopsy on the pathology findings was inconclusive. In our study, 26.3% of the patients had been treated with corticosteroids prior to biopsy. However, even after excluding the 25 patients who had used corticosteroids prior to biopsy, the majority of the previous correlations were still in the same direction and of the same magnitude, with the exception of a moderately positive correlation observed between endomysial fibrosis scores and CK levels (r=0.51, p<0.01). We found that previous CS use did not influence the inflammatory score, agreeing with Pinhata et al. , although using the different pathology scoring method. Furthermore, in multivariable linear regression analysis, after adjusted for age, gender, disease duration, current dose of CS and immunosuppressive drug use, we found no significant correlation of CS use and any of muscle biopsy scores. Although different scoring systems were used, Louthrenoo et al. , found that the degree of muscle destruction and inflammation was negatively associated with weakness but positively correlated with CK. That study also found that ESR showed no correlation with muscle weakness, CK, or muscle pathology, which agrees with our findings . Schwarz et al. , however, found no correlation between muscle pathology and clinical parameters in IIM patients. Differences in findings may be due to the fact that different muscle scoring systems were used as well as to the diversity of the study populations. Moreover, inflammation in IIM patients has been reported to be spotty . In addition, taking a biopsy from a non-inflamed muscle may bias the findings. The majority of biopsies (91.6%) in this study were taken from biceps by the attending rheumatologist from a muscle that was moderately clinically affected. However, the biopsies were not MRI-based because at the time of this study MRI-guided muscle biopsy was not available in our institution. Other limitations of this study included the small sample size of the patient group 2 and 3; as a tertiary referral autoimmune rheumatic disease center for the northern Thailand, most IIM patients had a higher frequency of group 4. The heterogeneity of the study population among the different subgroups, especially disease duration, may have affected the pathology findings. In addition, the criteria of Bohan and Peter [1, 2] used to classify our study population cannot distinguish polymyositis from inclusion-body myositis. Furthermore, enzyme histochemistry and immuno-histochemistry staining techniques for muscle pathology analysis were not available for most of the muscle biopsy specimens during the study period. Finally, due to the limited number of muscle pathologists at our institution, the muscle biopsies were read by a single experienced muscle pathologist blinded to clinical data; therefore, the interobserver and intraobserver variability should be further validated. This study did have several strengths, including the large sample size of IIM patients in group 4. Additionally, the study provided valuable insights into muscle pathology findings determined using our newly developed muscle biopsy score system. The study also provided useful data regarding the relationships of muscle biopsy scores with the clinical and laboratory variables in the different subgroups of IIM patients. In conclusion, in this study, muscle biopsy cannot be used to differentiate among subgroups of IIM patients. In addition, we found only modest correlation of muscle biopsy scores with muscle power and CK. Further study is necessary to confirm our findings. The authors would like to thank Mrs. Saowanee Puntana for her secretarial assistance. We would also like to thank Dr. G. Lamar Robert, Ph.D. and Dr. Chongchit Sripun Robert, Ph.D. for manuscript editing. Bohan A, Peter JB. Polymyositis and dermatomyositis (second of two parts). N Engl J Med 1975; 292(8): 403-7. Bohan A, Peter JB. Polymyositis and dermatomyositis (first of two parts). N Engl J Med 1975; 292(7): 344-7. Medsger TA Jr, Oddis CV. Classification and diagnostic criteria for polymyositis and dermatomyositis. J Rheumatol 1995; 22(4): 581-5.
 van der Meulen MF, Bronner IM, Hoogendijk JE, et al. Polymyositis: an overdiagnosed entity. Neurology 2003; 61(3): 316-21. Dalakas MC, Hohlfeld R. Polymyositis and dermatomyositis. Lancet 2003; 362(9388): 971-82. Hoogendijk JE, Amato AA, Lecky BR, et al. 119th ENMC international workshop: trial design in adult idiopathic inflammatory myopathies, with the exception of inclusion body myositis, 1012 October 2003, Naarden, The Netherlands. Neuromuscul Disord 2004; 14(5): 337-45. Troyanov Y, Targoff IN, Tremblay JL, Goulet JR, Raymond Y, Senécal JL. Novel classification of idiopathic inflammatory myopathies based on overlap syndrome features and autoantibodies: analysis of 100 French Canadian patients. Medicine (Baltimore) 2005; 84(4): 231-49. Schwarz HA, Slavin G, Ward P, Ansell BM. Muscle biopsy in polymyositis and dermatomyositis: a clinicopathological study. Ann Rheum Dis 1980; 39(5): 500-7. Louthrenoo W, Weerayutwattana N, Lertprasertsuke N, Sukitawut W. Serum muscle enzymes, muscle pathology and clinical muscle weakness: correlation in Thai patients with polymyositis/dermatomyositis. J Med Assoc Thai 2002; 85(1): 26-32. Wedderburn LR, Varsani H, Li CK, et al. International consensus on a proposed score system for muscle biopsy evaluation in patients with juvenile dermatomyositis: a tool for potential use in clinical trials. Arthritis Rheum 2007; 57(7): 1192-201. Ringel SP, Carry MR, Aguilera AJ, Starcevich JM. Quantitative histopathology of the inflammatory myopathies. Arch Neurol 1986; 43(10): 1004-9. Prasad ML, Sarkar C, Roy S, et al. Idiopathic inflammatory myopathy: clinicopathological observations in the Indian population. Br J Rheumatol 1992; 31(12): 835-9. Hochberg MC. Updating the American College of Rheumatology revised criteria for the classification of systemic lupus erythematosus. Arthritis Rheum 1997; 40(9): 1725. Preliminary criteria for the classification of systemic sclerosis (scleroderma). Subcommittee for scleroderma criteria of the American Rheumatism Association Diagnostic and Therapeutic Criteria Committee. Arthritis Rheum 1980; 23(5): 581-90. Galiè N, Hoeper MM, Humbert M, et al. Guidelines for the diagnosis and treatment of pulmonary hypertension. Eur Respir J 2009; 34(6): 1219-63. Medical Research Council. Aids to the investigation of peripheral nerve injuries. Medical Research Council War Memo. 1943. Koh ET, Seow A, Ong B, Ratnagopal P, Tjia H, Chng HH. Adult onset polymyositis/dermatomyositis: clinical and laboratory features and treatment response in 75 patients. Ann Rheum Dis 1993; 52(12): 857-61. Dankó K, Ponyi A, Constantin T, Borgulya G, Szegedi G. Long-term survival of patients with idiopathic inflammatory myopathies according to clinical features: a longitudinal study of 162 cases. Medicine (Baltimore) 2004; 83(1): 35-42. Bronner IM, van der Meulen MF, de Visser M, et al. Long-term outcome in polymyositis and dermatomyositis. Ann Rheum Dis 2006; 65(11): 1456-61. Torres C, Belmonte R, Carmona L, et al. Survival, mortality and causes of death in inflammatory myopathies. Autoimmunity 2006; 39(3): 205-15. Chen YJ, Wu CY, Huang YL, Wang CB, Shen JL, Chang YT. Cancer risks of dermatomyositis and polymyositis: a nationwide cohort study in Taiwan. Arthritis Res Ther 2010; 12(2): R70. Shu XM, Lu X, Xie Y, Wang GC. Clinical characteristics and favorable long-term outcomes for patients with idiopathic inflammatory myopathies: a retrospective single center study in China. BMC Neurol 2011; 11: 143. Fernandez C, Bardin N, De Paula AM, et al. Correlation of clinicoserologic and pathologic classifications of inflammatory myopathies: study of 178 cases and guidelines for diagnosis. Medicine (Baltimore) 2013; 92(1): 15-24. Liu WC, Ho M, Koh WP, et al. An 11-year review of dermatomyositis in Asian patients. Ann Acad Med Singapore 2010; 39(11): 843-7. Pinhata MM, Nascimento JJ, Marie SK, Shinjo SK. Does previous corticosteroid treatment affect the inflammatory infiltrate found in polymyositis muscle biopsies? Clin Exp Rheumatol 2015; 33(3): 310-4.